New report says that polar bears are doing well despite reductions in sea-ice. Toronto, 27 February: In a new report published by London-based think tank, the Global Warming Policy Foundation, zoologist Susan Crockford says that predictions that climate change is bringing about the demise of these iconic creatures have proven to be far from the mark. 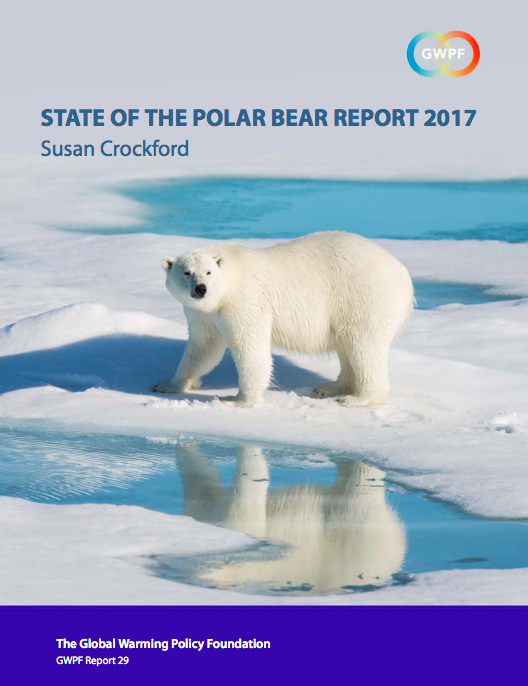 The State of the Polar Bear Report 2017 summarises clear, reliable and concise information on the current state of polar bears in the Arctic since 2014, relative to historical records. It highlights up-to-date data and research findings in a balanced and factual format that avoids hype and exaggeration. It is intended for a wide audience, including scientists, teachers, students, decision-makers and the general public interested in polar bears and Arctic ecology.